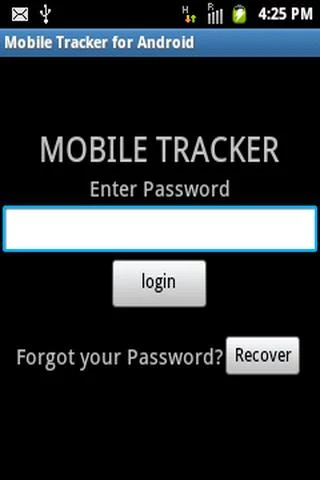 * Step 1: Install Mobile Tracker from Google Play. * Step 2: Set Up Password for your secure access. * Step 3: Pick 4 Contacts and click save to store those contact numbers inside this app. * Step 4: Go to Options and clicks uninstall security and activate it for uninstall protection. After mobile phone get stolen/lost, and when the new SIM card is inserted in the mobile, this app begins and automatically sends SMS from the SIM card which is inserted. Once the SMS is received, you can make a complaint on that number you received SMS from and track your mobile. * This Application read the contacts and save into the private SharedPreferences, Which makes the user to pick the individual contact to store in the application and to find the contact numbers(Which is visible) when user get in to this app. This Application won’t use the contacts for any other purposes. * This Application uses permission to send SMS from the application automatically when SIM change and for password recovery. SMS send by the application when SIM change /at password recovery, will cost you money as per SIM card network plan.